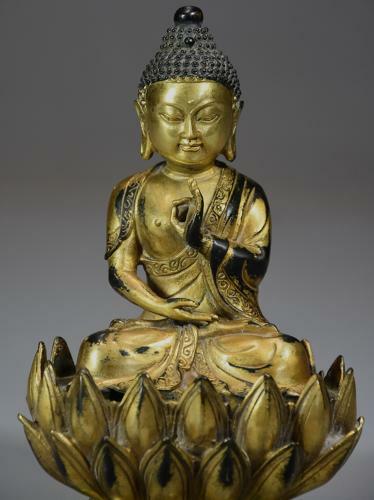 The Buddha is depicted sitting cross legged within the lotus flower, his right hand resting and his left hand raised, the Buddha's hand gestures are known as Mudras. This mudra is possibly the 'Vitarka Mudra' which signifies discussion and transmission of the teachings of the Buddha. The symbol of the lotus flower is associated with purity and beauty in both Buddhism and Hinduism. This bronze is in very good condition for age, is of stable construction and can go straight into a home.